Parking: Lafayette Place Trailhead Parking (just off of I-93), 2 privies available at trailhead, open year-round. Although I’ve hiked the Franconia Loop dozens of times, most of those times have been during the summer or fall when the days are longer and the temperatures warmer. Of the handful of times I’ve hiked it during the winter, the day it was -20F at the base really stands out in my memory… that was the day I decided that there really was such a thing as too cold!!! By comparison, the 14F temperatures that greeted me at the trailhead parking lot last week seemed downright balmy! 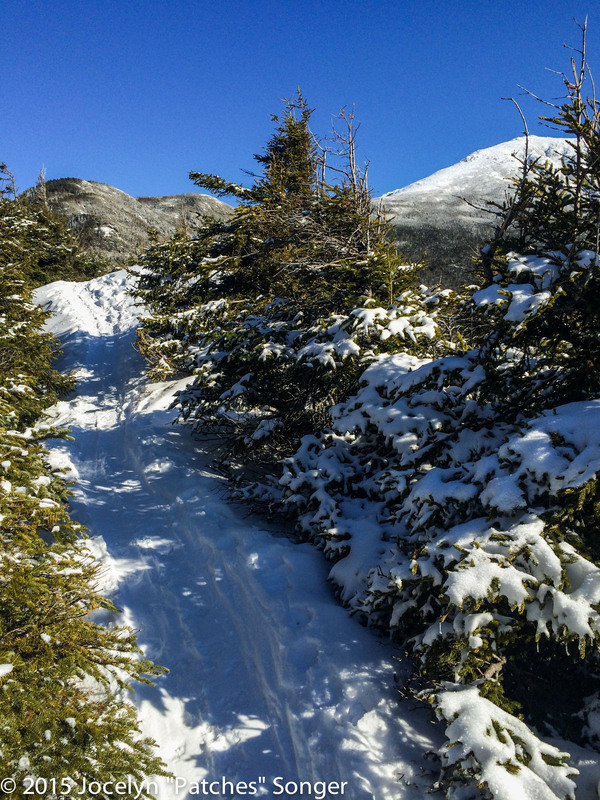 The first view of Franconia Ridge from the Old Bridle path… If that’s not motivation I don’t know what is! Difficulty Level: Strenuous. The trail gains 2,450 ft in 2.9 miles… anything approaching 1000 ft of elevation gain per mile qualifies as strenuous in my book. Trail Conditions (9/10): Well-tracked, soft-packed powder. Occasional icy spots, easily avoidable. Vistas (8/10): After 1.5 to 2 miles, amazing views of Franconia Ridge ahead and the valley behind are common. Greenleaf Hut and the Franconia Ridge as viewed from the Old Bridle Path. I donned my microspikes and set off, alone, into the quiet, snowy, New Hampshire morning. After two solo thru-hikes it felt both strange and incredibly normal to be heading off into the snow-covered mountains by myself, but mostly it just felt great to be moving in the mountains I loved with beautiful blue skies above and sparkling white snow below. The only thing that dampened my spirit was that I couldn’t find my ‘good’ camera when I stopped to take pictures at the first overlook. I assumed I must have forgotten it back at the car in my excitement to get out on the trail… My iPhone 5 would have to serve as my camera for the day! On the Old Bridle Path looking ahead towards Mt. Lafayette. The trail all the way up to Greenleaf hut was beautifully snow-covered. Even though extra gear and precautions are necessary for winter hiking, one of my favorite things about the snow is that it covers and smooths out the normal rocky backbone of the trail and creates a strangely uniform hiking surface… The nice, stumble-free, snow-covered terrain reminded me of the PCT, but the grade of the Old Bridle Path was way too steep for that! I gained 2,450 ft in the 2.9 miles it took me to get up to Greenleaf Hut (closed & boarded up in the winter), and I still had a mile to go to get the the summit of Lafayette! Greenleaf Trail and the summit of Mt. Lafayette as viewed from the trail. How many cairns can you count in frame? 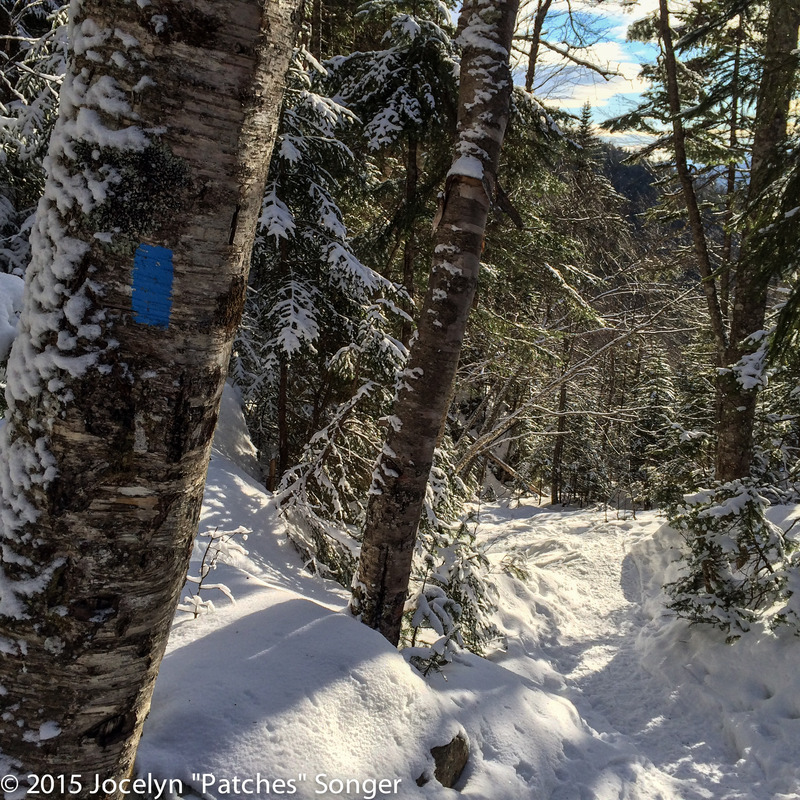 Trail Conditions (8/10): partially-tracked, lightly-packed wind-swept snow, some possibility for postholing. Windy! Vistas (9/10): Primarily above treeline with sweeping vistas. Near Greenleaf Hut I ran into a couple of people on their way down. They assured me that the trail conditions at the summit, along the ridge, and on Falling waters were great… Our excitement about the unusually warm, clear White Mountain weather was almost palpable… and it was certainly visible on all of our smiling faces. Not long after leaving the hut I left the scrubby treeline entirely behind me, and embraced the blinding sun and whipping winds characteristic of Greenleaf trail in the wintertime. The sandy snow made that final mile to the summit of Mt. Lafayette seem to go on forever… I wasn’t postholing, but I could feel myself backsliding a little bit with each step… It didn’t help that I was almost 5000 ft above the elevation I’d slept at the previous night! 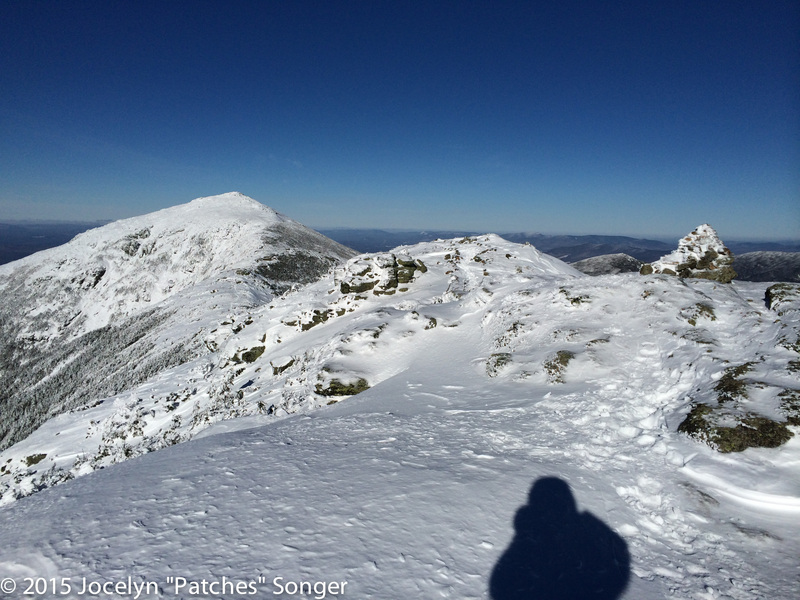 Looking across the windswept snow to the rest of Franconia Ridge. Either way, I didn’t hesitate to take a break when I encountered a rare site on Mt. Lafayette… a group of 5 skiers struggling up the slope. Sure they were struggling on the uphill, but they were going to have it made on the way down! The steep, windswept approach to the summit of Mt. Lafayette from the Greenleaf Trail. After a few more photo breaks than were probably absolutely necessary, I made it to the windy summit of Lafayette! As I looked around I couldn’t help but smile… There’s nothing better than a beautiful clear day on the summit of Mt. Lafayette. I was kind of curious though, where exactly were those skiers going to go from the summit? The summit of Mt. Lafayette! Difficulty Level: Moderate, some ups and downs with drifting snow. Trail conditions (9/10): well-tracked, windswept powder. Windy! Vistas (10/10): Completely above treeline. 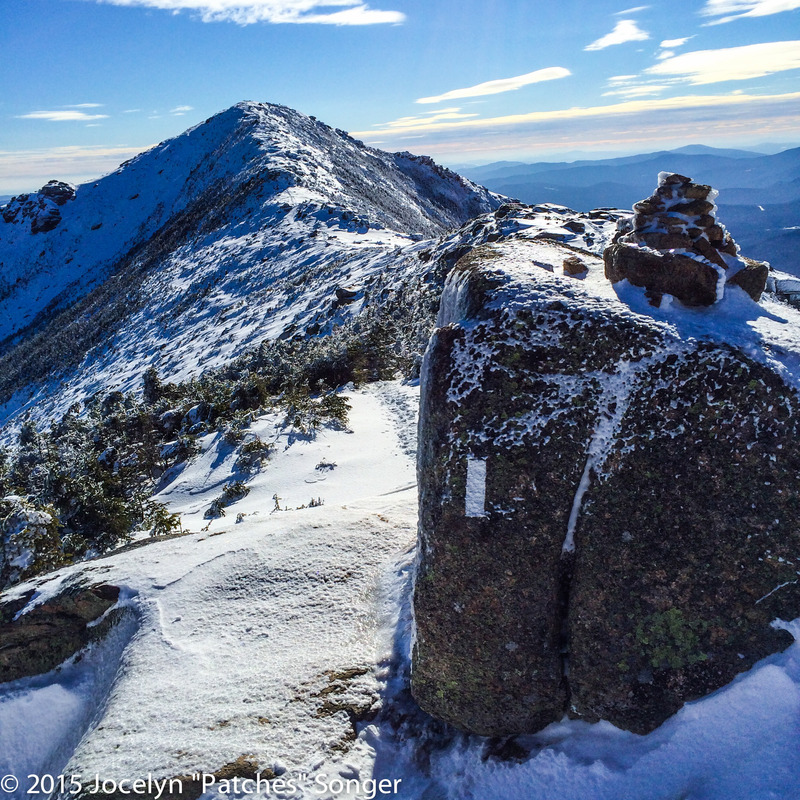 Amazing views of the ridge you’re on (Franconia Ridge) and of the Presidential range… Absolutely phenomenal! It felt good to be back on the Appalachian Trail (AT)… The last time I’d stood on the summit of Mt. Lafayette looking out at Mt. Washington was on my 2013 AT thru-hike… The sense of accomplishment I felt standing at the summit was for more than just climbing the mountain that day, but for the incredibly journeys of the last two years… It was a beautiful moment full of memories of the past and excitement about the new memories that I was creating right then and there. Obligatory summit selfie with Franconia Ridge in the background. Hello AT! Franconia Ridge is one of my favorite stretches of trail. It is incredibly beautiful, but it is also incredibly exposed… definitely not to undertaken lightly when hiking solo in the wintertime. I scrutinized the distant clouds… the weather was still miraculously clear, which was good, and I did a time check. It wasn’t even 1pm yet, but since it was the middle of the winter sunset would be come early, ~5pm… did I have enough time to do the ridge and descend to my car before dark? Yes. Plenty. If I got caught out after dark was I prepared? Yes. Were there any suggestions of iffy weather? No. Since I was winter-hiking solo, I did a quadruple check… Would another hiker with my level of skill and preparation think that this was a risky decision? No. Phew… Safety checks passed, I texted my parents, “heading across Franconia Ridge now, will descend via Falling Waters.” I’d given them an itinerary before I left, but sending them time-stamped updates seemed prudent. Patches happily visiting the AT on Franconia Ridge near the Summit of Mt. Lafayette. Every fiber of my being rejoiced at the opportunity to prolong my time on Franconia Ridge. It was such a gorgeous day, and as winter weather goes, it was as good as it gets! The winds weren’t too strong, the temperatures (in the teens) were moderate, and I had plenty of gear to keep me warm. I also discovered that as soon as I wasn’t going uphill anymore my toes completely warmed up!!! I was definitely excited about that! The Appalachian Trail’s familiar white blaze looking South down Franconia Ridge. About halfway across the ridge I encountered a northbound hiker, “How’s the trail ahead?” I queried. 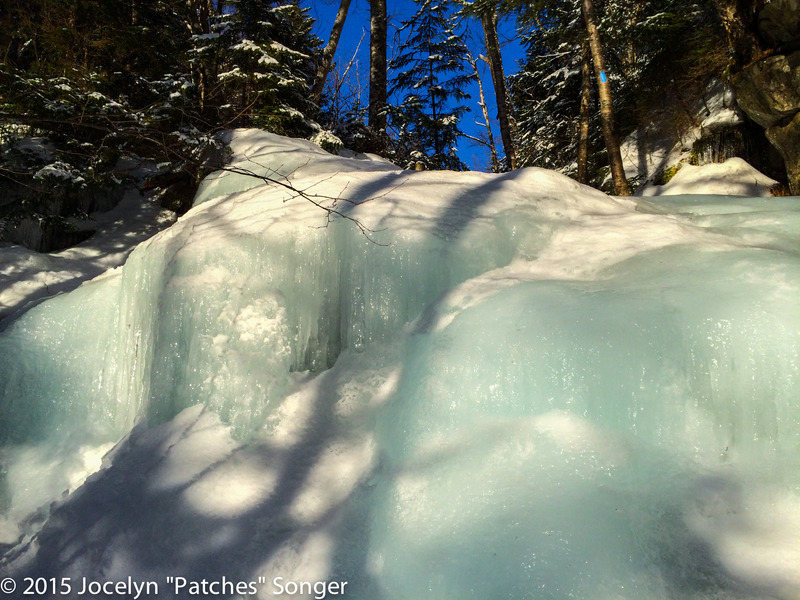 “Well, the ridge isn’t bad, but Falling Waters Trail is Icy… It’s as bad as I’ve ever seen it! It was so bad I had to use my ice axe to get up it!” he replied sounding slightly rattled… “Hmmm…” This was directly at odds with the trail report I’d gotten from the last person I talked to! Looking back at Lafayette and the way I’d come. After some contemplation, I continued hiking South along the AT. I remembered the sweeping vistas from my Northbound AT thru-hike, but somehow the snow made it all feel more magical! 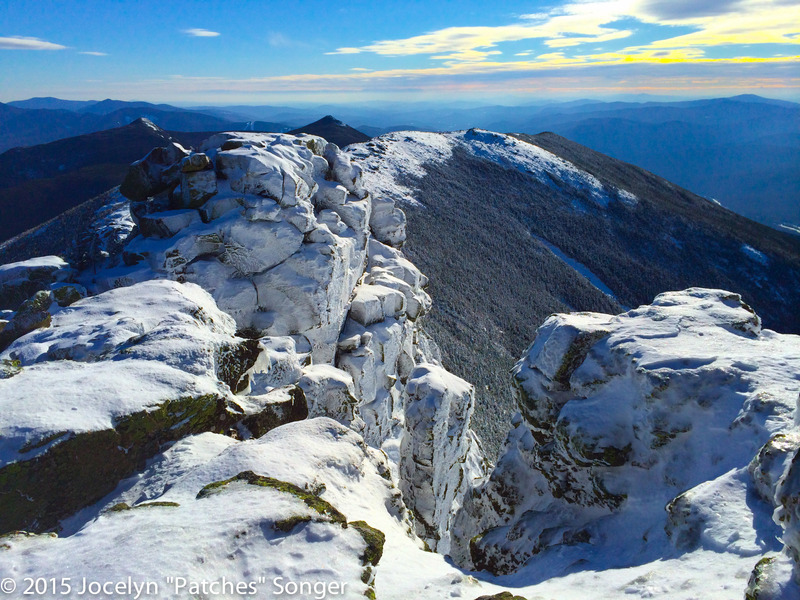 The windswept rocks of Franconia Ridge iced with snow! (On the AT, looking South). As I neared the end of the ridge and headed up Little Haystack I ran into one final group of people (total number of people encountered: 9). I asked the group of 3 guys how the trail had been. “It was great,” said one guy. “No Problem,” smiled one of the other guys. Standing on the AT in the middle of Franconia Ridge. “Oh?” replied the third guy, curiously. “Well… the last guy I talked to said it was the worst he’d ever seen it and that he’d had to use his ice axe.” Almost immediately they chimed in and admitted that they’d used their ice axes too, but assured me, “it’s not that bad, you won’t have any problems with it.” I looked at them kind of skeptically before quizzing them a bit more about where they’d used their axes… I tried to picture the trail ahead and the spot that they were talking about..but I had trouble imagining a spot where I’d need my ice axe… Well, I’d find out when I got there! One last glance at the ridge before heading down the Falling Waters Trail. Difficultly Level: Strenuous, steep downhill descending 2800 ft in 3.2 miles. Snow-cover decreases impact on knees compared to summertime conditions. Special Equipment: Microspikes/crampons. 3/4 people ascending cited use of ice axe on one section. I did not use an ice axe nor did I feel the need to. 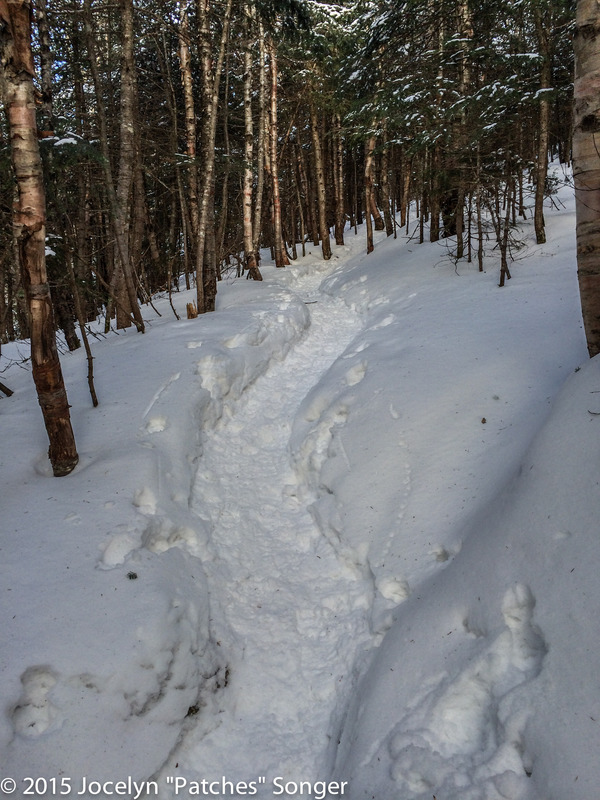 Trail Conditions (6/10): mostly well-tracked powder, however, some extremely icy sections are present on the lower 1/3 of the trail… Confidence traversing ice flows a must on this section. Vistas (7/10): The majority of the trail is below treeline. However, the views from Shining Rock are worthwhile and the ice formations and flows of the ‘falling waters’ make up for the lack of more sweeping views. Sometimes the trail seems even steeper when you are going down than when you are going up, and this definitely felt true as I headed down the Falling Waters Trail. It was steep, well-tracked powder, and it would have been a lot of fun to do some glissading… Unfortunately, I was below treeline and would have to navigate around a lot of trees in order to safely glissade… I was also afraid that I would end up going faster than I wanted to, so I decided to play it safe and stay on my feet. When I reached the falling waters section of the Falling Waters Trail I was fascinated by all the different ice formations in and around the stream. They were absolutely beautiful! 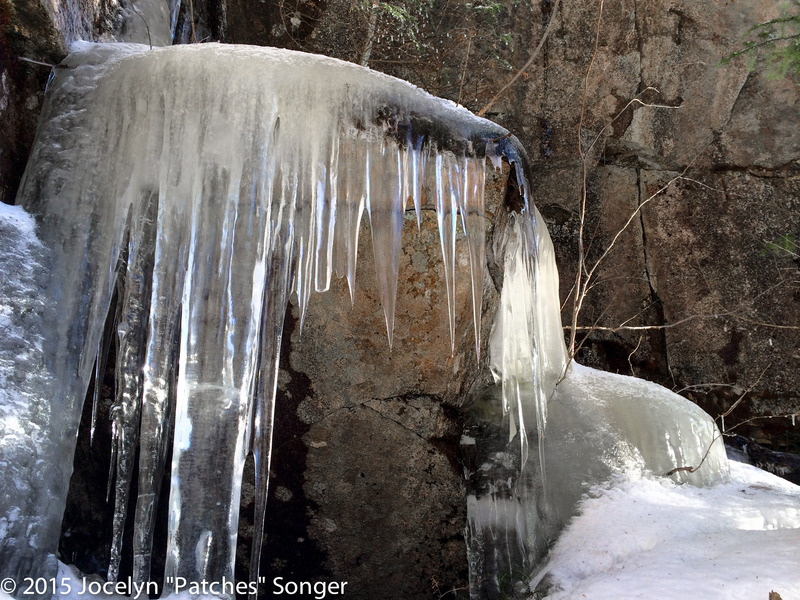 Icy Waters on Falling Waters Trail. 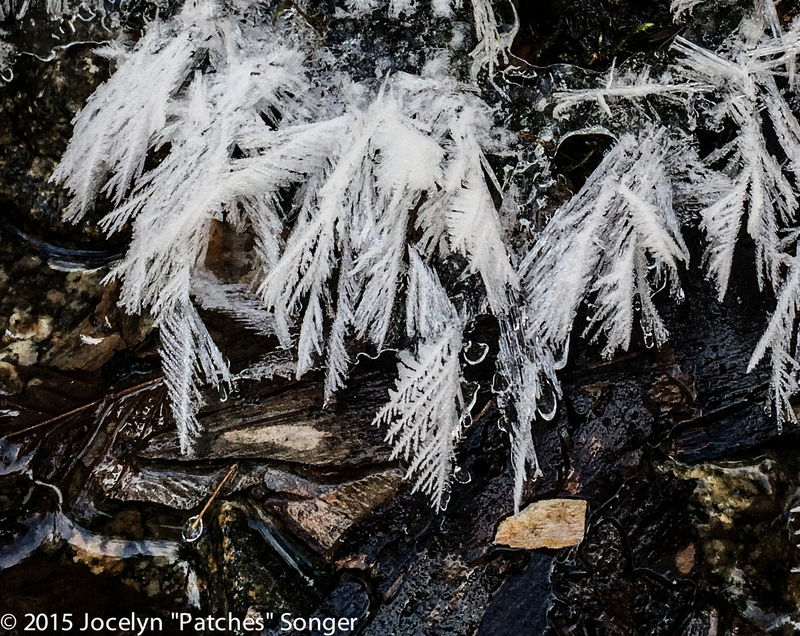 The ice formations were so beautiful that I couldn’t help but stop and take pictures of all of the the different kinds of ice… The feathery plumes were something that didn’t remember ever seeing before! About halfway down the Falling Waters Trail. 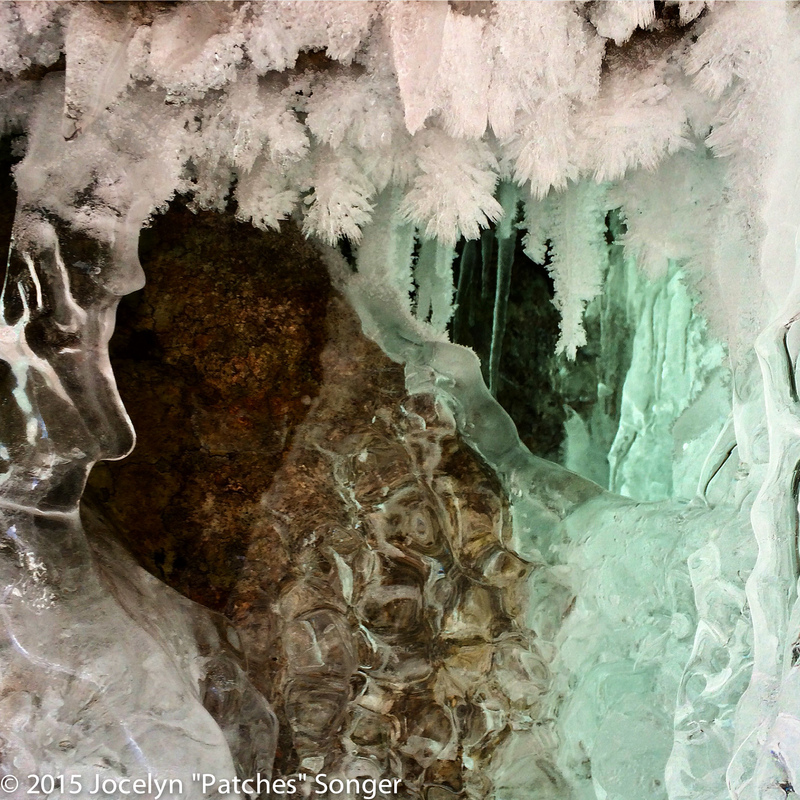 … until all the powder disappeared and was replaced with a wall of ice. 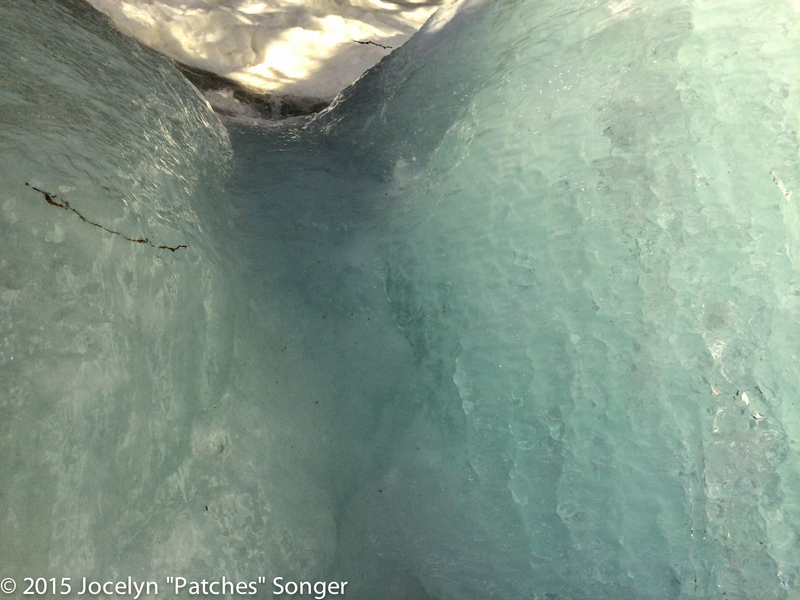 There was no doubt… the wall of ice below me was where everyone had used their ice axes. I stood at the top of the steep ice flows contemplating my options for a couple of minutes. It was clear that most people had used the ~5-6 ft long ice chute (pictured above) to my right instead of following the main trail with it’s steep 20-30 ft long ice flow (pictured below)… I continued contemplating my options… I didn’t like either of them, but eventually decided on the ice chute/glissade… once I was sitting down with my legs extended I’d be most of the way to the soft powdery snow below. 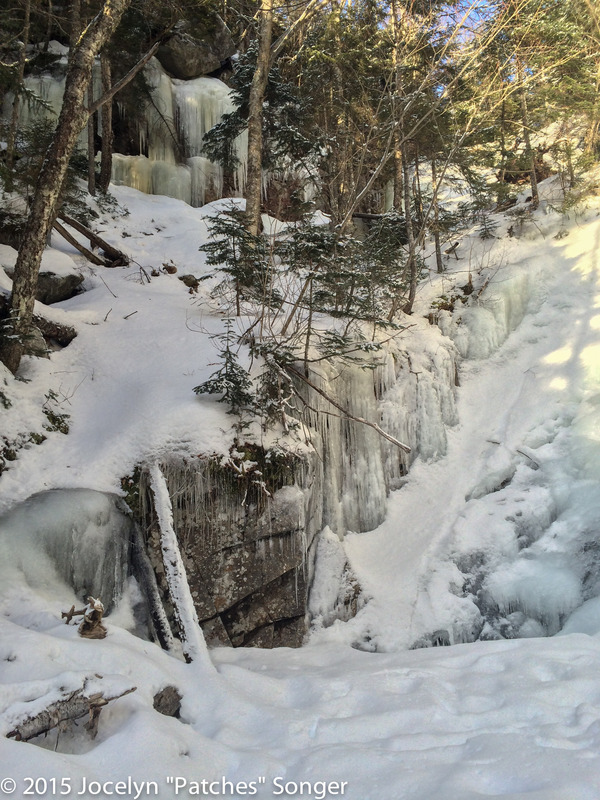 The iciest portion of the Falling Waters trail where people had been using their ice axes… though I’m not sure how. Check out that blue blaze up there? The trail is somewhere underneath the beautiful blue ice. Sure enough, the powder cushioned my short slide, no problem. 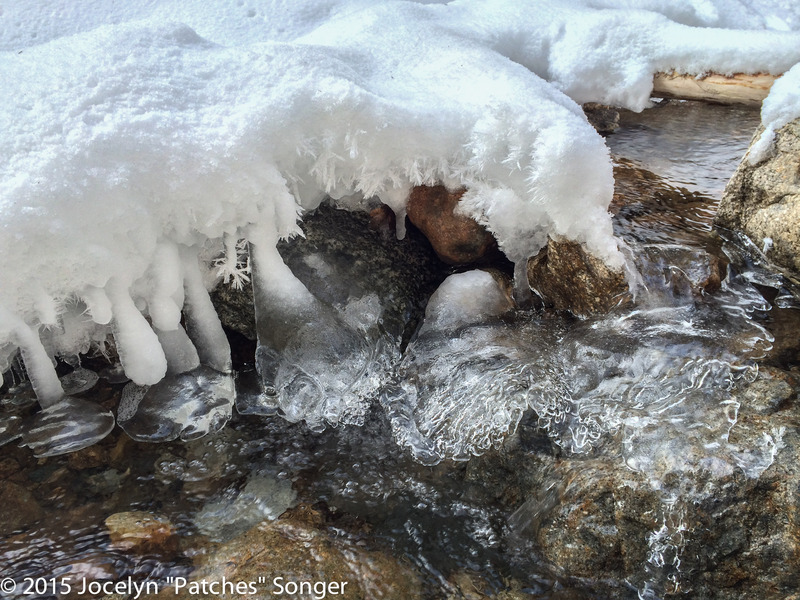 Despite the icy trail conditions, the thing that was really slowing me down wasn’t my footing… it was all the time I was taking to admire and take pictures of the cool ice formations along the way! Luckily for me, the icy section of the trail… the section where the trail held more ice than snow, was relatively short… about 1/4 mile, but I treated that section with extreme caution! 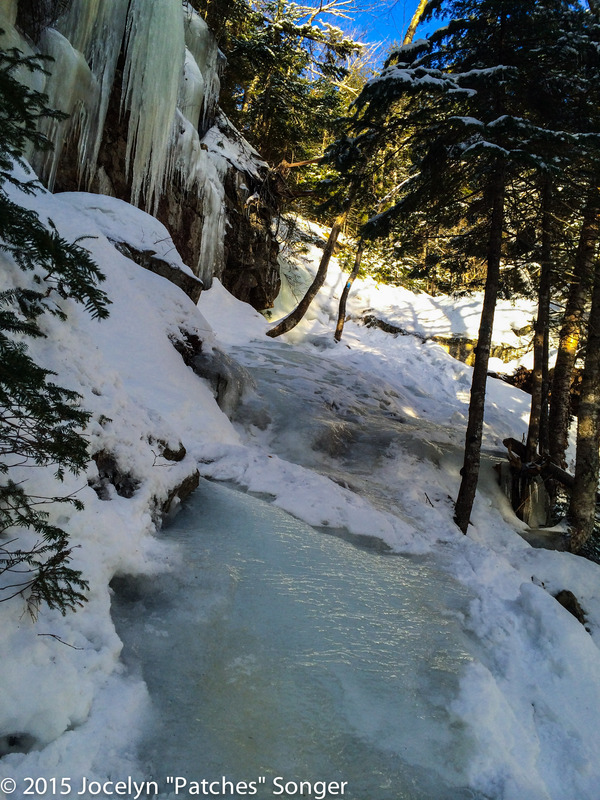 One of the icy sections of the Falling Waters trail. Even though I wanted to linger on the icy sections of the trail taking pictures and enjoying my hike for as long as possible, the magical low-angle light that was making everything extremely photogenic also signaled the fast approaching sunset. I reluctantly put my phone camera away and continued towards my car. Back at the car I searched for my ‘good’ camera, which I’d assumed I’d forgotten in the car during the hub-bub that morning… It wasn’t there… Doh! Was it possible that it was somewhere in my pack and I’d just missed it? I frantically emptied all of the contents of my pack out into my car… Still no camera… Oh sh**! My camera really was lost… My beautiful Sony Nex was somewhere between the car and the first overlook where I’d first noticed that it was missing. As I rounded the corner to the women’s privy I saw it, right in front of the privy, lying on the snow… my camera!!! It must have fallen out when I stopped there before my hike. Since I was the only woman on the trail that day, nobody else had ventured over to the women’s privy, and nobody else had seen it! Phew! With my camera in hand, and the sun beginning to set, I returned to my car and headed home… I was definitely a happy hiker! It had been an amazing day and the hike up Mt. 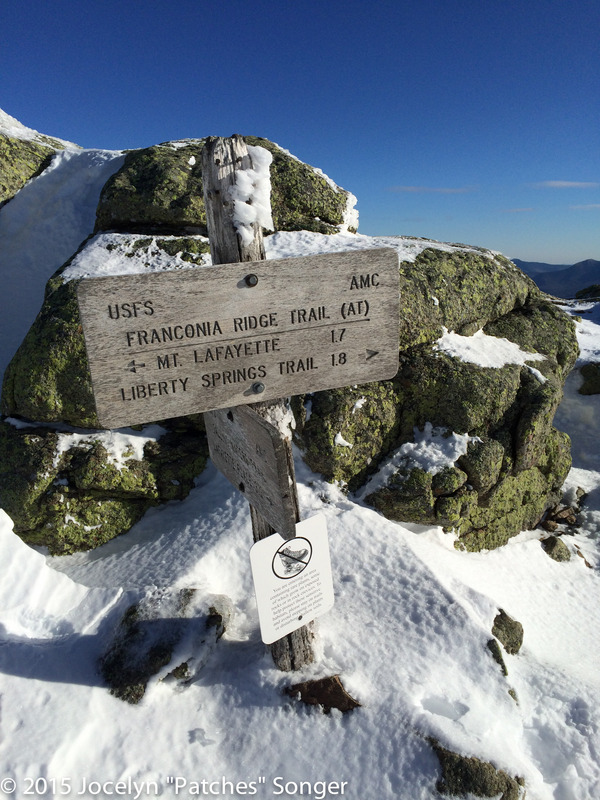 Lafayette and across Franconia ridge kept its place as one of my favorite hikes of all time. Consider checking out trip reports and forecasts here before heading up Lafayette. 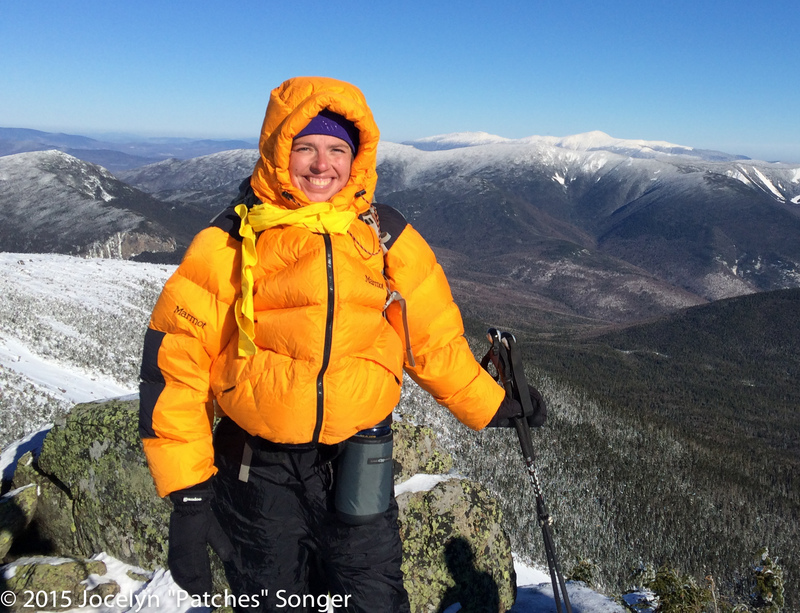 The weather in the White Mountains is notoriously bad (even in the summer), so when planning a winter hike in the Whites finding a good weather window is my primary concern… If I’m considering a climb of Mt. Lafayetter (5250 ft) I check the Mt. Washington summit forecast and look for a day with high temperatures > 5-10 degrees F, wind speeds < 30 mph, and no measurable precipitation predicted for that day or the next… Even with appropriate gear, low temperatures and high windchills significantly reduce the fun factor of the hike for me… been there, done that (like the day it was -20 degrees F at the base… brrrrrrrr!!!). 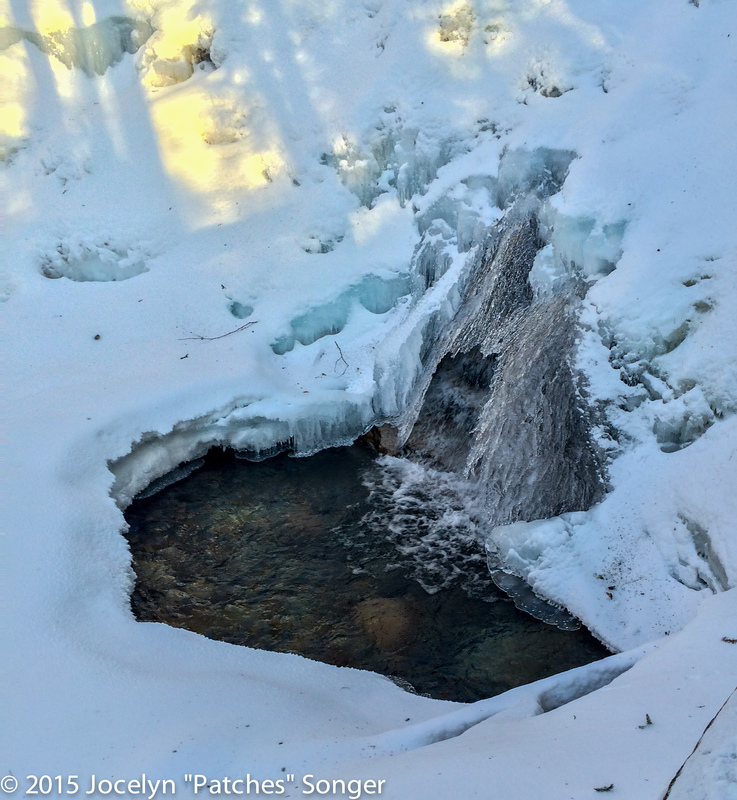 This entry was posted in Adventures, Appalachian Trail, Trip Report and tagged Appalachian Trail, day hikes, hiking, ice, ice axe, lafayette, snow, white mountains, winter. Bookmark the permalink. Wow! Great photos! This looks like an awesome hike! Amazing photos!! I loved reading about your dayhike. My little girls are getting hardy enough for outdoor winter play… just need some snow to make it fun! Lovely! Those photos are absolutely breathtaking. Beautiful! I’ve really enjoyed reading your blogs. Thank you! Just curious – when hiking in NH, have you ever run into Tom and Atticus of “Following Atticus” fame? What a beautiful area to explore. And your photos capture it so well.